I'm loving this TC Electronic Flashback Triple Delay. It's really a "one-stop-shop" delay, and with the 3 delays that can run into each other (serial switch on), I can get that really nice, clear, but long sustain on a swelled chord for instance. 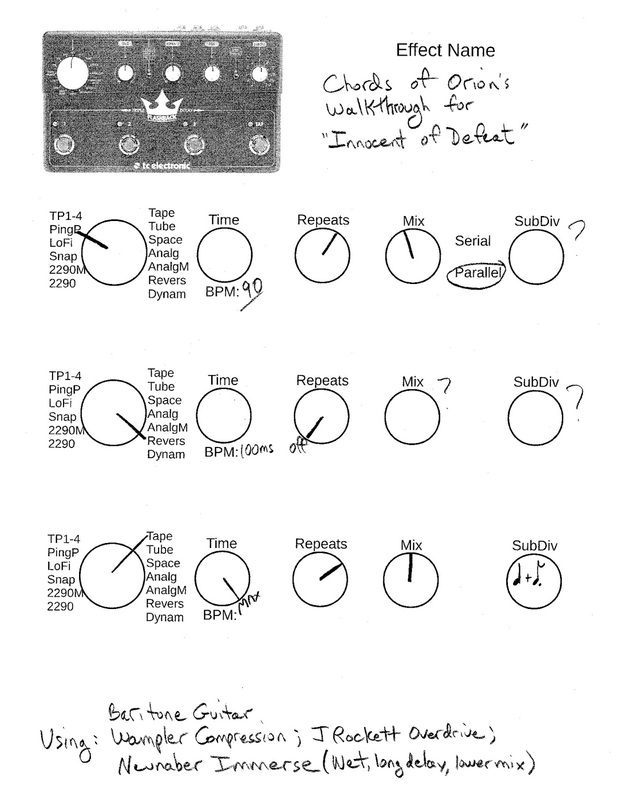 For each delay switch, (1, 2, 3), you can store one setting. That's good. But you really can't "see" that setting when you engage that delay. 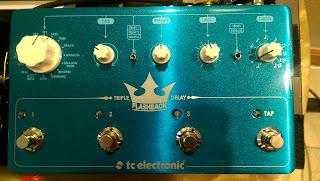 For instance, if you set up delay 1, then save it; then set up delay 2 and save, then 3 and save; now when you click on delay 1, you don't see what that delay consists of because all your knobs are set to the delay 3 setting that you last adjusted. So for now, until I get more savvy with this delay, I've created a form that I can fill out to ensure that each setting that I like doesn't get lost in my memory. 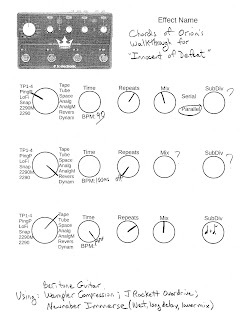 I've attached a blank PDF form, and also a PDF of a particular setting for the 3 delays that Chords Of Orion laid out in his song "Innocent Of Defeat." At left are the settings for "Innocent Of Defeat"